If you have ever been involved in an instructional materials adoption, you know there are dozens of programs out there claiming alignment. Collectively, these programs have thousands of pages of content. You also know that historically there’s been little to no information about the quality of the materials and whether they meet high standards. We know this challenge intimately at EdReports and recently introduced a revamped compare tool designed to lighten this burden. Our tool is a perfect jumping-off point to start your process to research the many options in the market. 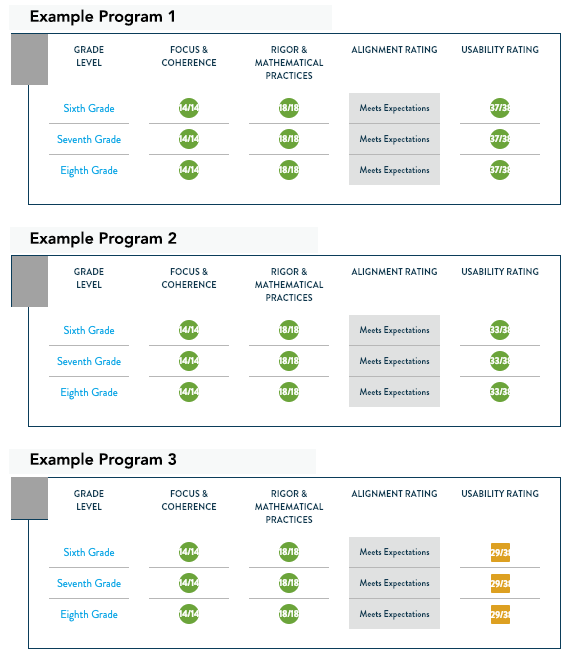 You can view multiple programs at once to see how they performed by grade-level and across categories of standards-alignment and usability. Of course, the compare tool is only the beginning. Choosing curriculum based on a snapshot of program performance is not a practice we would recommend given the importance and lasting impact materials have on school communities. It’s essential that your adoption committee dives deep into the reports to consider the evidence, particularly after analyzing student learning and classroom-level data. It is also essential to examine the materials yourselves, and identifying a manageable review lift will enable you to go deeper and make an even more informed decision. As you begin the journey in choosing the right program for your district, here are a few tips for how adoption committees can make the most of the EdReports compare tool. Tip 1 – Find out what's available. As the district adoption committee, you’ve already established the district’s instructional materials’ priorities. The compare tool offers a variety of ways to view and sort information depending on those priorities. In the compare tool, materials can be organized broadly by content area (e.g., all K-8 math programs) and then sorted by a variety of features including titles by alphabetical order, gateway scores, and alignment ratings. For adoption committees, it can be helpful to cast a wide net before narrowing your choices to a more manageable size for further investigation. By searching across multiple programs, you may learn of new products or ones that you did not know meet your criteria. By selecting the category you’re most interested in (i.e., “focus and coherence” or “text quality”) before drilling down into specific materials or grades, it’s possible you’ll find high-quality materials the committee would be interested in considering. This overarching view of all programs and the ability to sort based on multiple criteria provides a quick snapshot of how well all programs performed. Tip 2 – Explore grades within a program. While you can filter by specific grades on our compare tool, it is unlikely that this will be the most important view for your committee since most districts are looking for a program that spans multiple grade bands (e.g., math K-5, science 6-8, high school ELA). Our compare tool is designed to show you how well materials meet expectations across multiple grades. We know that coherence year-over-year is critical for student success —a second grader’s knowledge and skills are built upon what she learned in first grade and kindergarten. A program that is rated highly in a single grade but performs poorly in several others may mean that it is unable to meet your students’ needs. The tool offers the ability to view all grades across each alignment and usability rating. You can do this for a single program or compare across many. This helps you to understand more about the strengths and weaknesses of specific grades within a broader program before diving into the reports. Tip 3 – Narrow your options based on alignment. The pool of curriculum possibilities may be larger than you anticipated. It can be difficult to know what to do next and how to start your research. Most adoption committees, no matter how dedicated, do not have the time, resources, or capacity to comprehensively evaluate dozens of different math and ELA programs. Sorting by alignmentWhittling down choices to a few programs the committee would like to explore in-depth is another great use of the compare tool. One way to filter is to focus on alignment to college- and career-ready standards and look at programs side-by-side on one page. For example, if you select the “alignment” tab you’ll have options to choose: “Meets Expectations”, “Partially Meets Expectations”, or “Does Not Meet Expectations” and you can see every program that falls into those categories. Or if you already know the specific programs you’re considering for adoption, you can select these and Programs sorted by alignment ratingsthen sort this subset by whether or not the materials meet, partially meet, or did not meet expectations. Comparing programs to one another based on alignment ratings allows the committee to be strategic about its investment of time and resources and ensures deep dives are focused on programs that have already achieved a baseline of quality. It’s not just about saving time; it’s about making the most of the time districts have. Additionally, should the district want to introduce potential programs to stakeholders—such as through a field test with teachers and students or community engagement around the materials being considered—narrowing the possible programs is a strong communications choice. Presenting data about how well programs are aligned to the standards builds trust with stakeholders and, more importantly, helps you to ensure you’re choosing from strong options. The EdReports compare tool can support conversations critical to a successful adoption process. 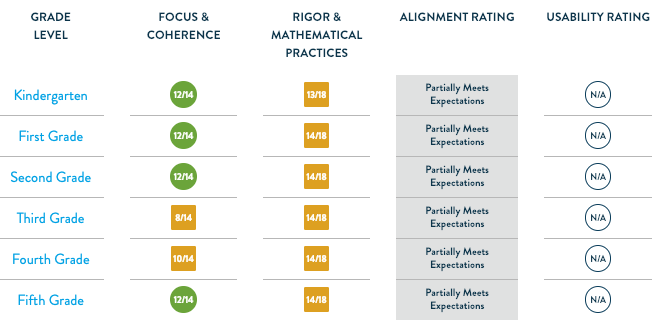 The compare tool is one resource among many to help adoption committees communicate with teachers about materials under consideration as well as with other district leadership about recommendations. What’s more, the information supports adoption committees and educators to see where they can put the bulk of their analysis time and resources. As you begin your materials adoption, use this functionality as a way to determine what areas of specific programs should be explored further. It will help you to ensure the materials chosen are not only aligned to standards, but also meet the unique needs of the teachers and students in your community.